Naming the beneficiaries of an insurance policy seems likes an easy thing to do. If a person is married, the spouse is the beneficiary. The children are often named as contingent beneficiaries. If a person is not married but has children, the children are often named as first beneficiaries. Usually, these are the people that life insurance is intended to benefit, however, without knowing or considering the consequences of the beneficiary designation, the policy holder’s intended goals may be thwarted. 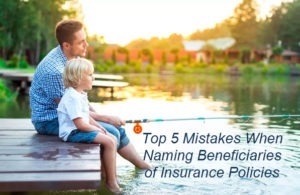 Below are the top 5 mistakes people make when naming a beneficiary of their insurance policy. The beneficiary named when a policy is obtained may not be the appropriate beneficiary at a later date. It is important to update the beneficiary designation on a regular basis to reflect changes in life circumstances, not only for the policyholder but also for the named beneficiaries. Beneficiary designations should be reviewed every two to three years and upon important life events like births, deaths, divorces, and significant changes in asset makeup. Many policyholders only name one person as the beneficiary of the insurance policy assuming he or she will outlive the beneficiary. However, if the policyholder does not outlive the beneficiary and did not update the beneficiary designation, the policy proceeds will be subject to probate at the policy holder’s death. In many states, probate is expensive and time-consuming. The failure to name a contingent beneficiary will result in the policy proceeds being used for probate court and attorney fees instead of going directly to your beneficiary. An unintended consequence of the probate may be that the ultimate beneficiary of the policy, i.e. a minor child or person receiving needs-based government benefits. It is important to name contingent beneficiaries and update the beneficiaries often. Parents, especially single parents, obtain life insurance to provide for their children in case they die before the children are grown and finished with school. But naming the minor child as a beneficiary is a mistake. In many states naming a minor as the beneficiary of a life insurance policy, either directly or indirectly because the policy was subject to probate, will subject the life insurance proceeds to a court-ordered guardianship of the estate for the minor child. Thousands of dollars will be wasted in court and attorney fees due to the guardianship procedure and bi-annual accountings that must be provided to the court. Upon attaining 18 years of age, the child is entitled to receive the full balance of the policy proceeds. At that age, even the most responsible individuals will be overwhelmed with inheriting a large amount of cash and many don’t end up using the proceeds as the deceased parent intended. The solution is to leave the proceeds in trust for the benefit of the minor child. This allows the policyholder to control how the policy proceeds are used and at what age the beneficiary has access to the proceeds without court supervision. Naming a person with special needs who receives needs-based government benefits as the beneficiary of a life insurance policy may cause the beneficiary to lose his government benefits. If the policyholder wants to provide for the special needs person, creating a special needs trust and naming the special needs trust as the beneficiary can protect the assets for the beneficiary. The proceeds in the trust are used to supplement the government benefits instead of eliminating them. Creating the trust with the special needs person as the beneficiary also eliminates gifting issues and family conflict issues that often occur when a sibling or other family member is named as the beneficiary of an insurance policy whose proceeds are intended to be used for the person with special needs. Many people create living trusts and assume that their estate plan, including the distribution of insurance proceeds, is taken care of. This is wrong. The life insurance policy beneficiary designation controls where the money is distributed, not the trust. For the trust to control how the life insurance proceeds are distributed, the trust itself has to be named with the insurance company as the life insurance policy beneficiary. Remember that life insurance proceeds are income tax-free whether an individual or a trust is the beneficiary. If minors or special need dependents are to benefit, or if the trust merely needs liquidity to deal with bills or debts, then naming the trust as the direct beneficiary of the insurance policy can be a great advantage. Life insurance beneficiary designation is very important and failure to properly name beneficiaries can have unintended consequences. My wife and I pretty much know how much starting a Living Trust will cost us but how much will it cost our two adult daughters, who will be on the trust with us, when we are gone? Is there a percentage charge? Your successor Trustees “role up” to acting trustee upon your death or incapacity is built into the plan and not subject to a specific charge. For example, to access a financial account in the Trust, they simply provide a copy of the trust and your death certificate to the financial institution and they will be added to the signature card. If selling real property titled in the trust, they simply submit the same documents to escrow. It’s that simple. If things get or seem complicated to them at the time, they can reach out to us for a complimentary review of their role and responsibilities. If they actually need additional services from us beyond that, the charges are very reasonable.